The Girlfriend is up there with one of the best thrillers this year for me, its in the top 5 for sure. Laura has it all, or so it seems. A career that she has worked hard for, a long marriage to a wealthy man and her son that she dotes on. He to Laura, is the perfect son. When he meets Cherry and spends 3 days in a row with her - Laura wants to meet her, i mean who is the girl that has captured Daniels heart. Surely she is perfect. Cherry is desperate to meet Daniels family and cannot wait to be welcomed in and share the future with them. However, when everything isn't as it seems. The friendship between the pair becomes very strained. When a major tragedy strikes the family, a lie is told. Apparently with good intentions, but non the less a lie. The fall out changes the game completely. 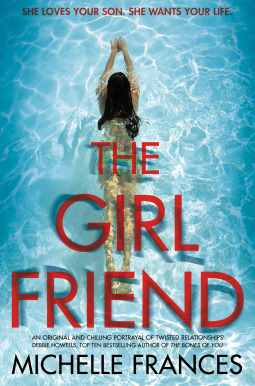 The girlfriend is a fast paced dramatic thriller not like others on the market, it twists and turns and goes deeper and darker. I found i was constantly changing my mind on my opinions of the characters. I liked them, then felt sorry for them, then couldn't imagine what they were thinking. I flew through it and this was down to the genius writing style that kept the narrative moving. It was nail biting good, and i was like i couldn't read quick enough to get answers. Would so recommend this to anyone and everyone. Michelle Frances graduated from Bournemouth Film School in 1996 and then from the Masters programme at the American Film Institute, Los Angeles, in 1998. Returning to London, she has worked for several years in film and TV as a script editor and producer for both the independent sector and the BBC. The Girlfriend is her first novel.